1. Colorbar "Take me as I am" lipstick in Bare Dare Pink: The perfect neutral lipstick, though some of you might not agree with me regarding the color description as such, this shade comes out as neutral on my pigmented lips. Know to be dupe of the costly Clinique chubby sticks, it came with a free sharpner. The formula is creamy and one swipe is more than enough to obtain a pigmented shade. Hydrates and moisturises my lips for good 4-5 hours and after which feels a lil heavy. Easily transfers to surfaces and one major con is the smell; smells crayony and plasticy, but doesn't lasts long. So until I find a neutral shade that is as flattering as this one, I would give all the blahs a miss. 2. 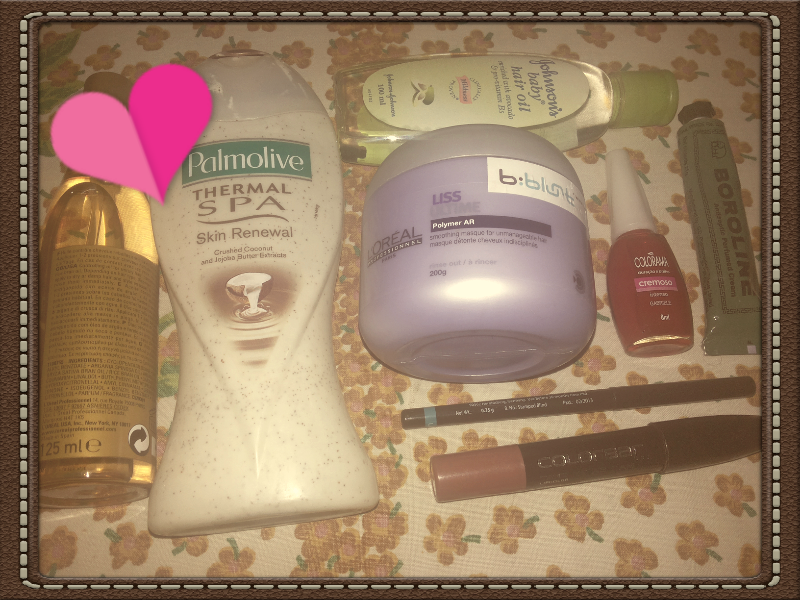 Palmolive "Skin Renewal Thermal Spa" : I bought this after I seeing Namitha's review. Smells coconuty fresh. Gives scrub+moisturizing effect to the skin. Come winters and I may have to change body wash to something more hydrating. I stick to a particular body wash only until I get used to it's fragrance and dear sweet coconuty body wash, best of luck and hope I don't get sick of you soon. 3. MAC studio fix powder: Love of my life and a knight in shining armor. Helps to even out my skin tone as I am slightly darker near the eyes and mouth. Stays for a long time and comes out natural in pics. Price wise, slightly on the higher end, but then who hits a pan in 2 years. I expect it to be a total paisa wasool. 4. Lakme eyeconic: If im asked to choose between colossal kajal and EYECONIC KAJAL, I would definitely pick eyeconic. I use kajal in my waterline. Eyeconic gives me rich black eyes . The formula is creamy and remains smudge free for 8 or more hours on my eyes. Colossal on other hand tends to break (3 times a row) and would smugde faster as compared to eyeconic. 6. Loreal "Mythical oil" and "Liss Ultime" mask: My wayward hair loves the duo, so much so that they refuse to behave well without em. Have been using the two products suggested by the b:blunt stylist for last 3 weeks and WHAT a considerable change in hair texture. For shampooing I use my regular Tresemme rough hair tube. 7. Jhonsons baby oil: On weekends, before discovering product, I used to go through elaborate oiling-->shampooing-->conditioning routine. Though I can add coconut oil in my food (Mallu you see), can't stand the heavy feeling on my hair. I bought home this product and I apply the oil on my scalp and from mid to ends before every wash. The net effect after conditioning is healthy looking, manageable, non-weighed down hair. 8. Boroline cream: Not exactly a beauty product, but even after being dry skin type, there are days when a small pimple sprouts up on my face. Boroline is an antiseptic ointment which can be easily bought from a pharmacy store. I apply it while going to bed and the next day, it brings down the redness and removes the puss from the pimple. Boroline is also a good moisturizer during colder times. Oily beauties stay away from this miracle product as the formula by itself is sticky n oily. 9. Nailpolish Maybelline Colorma: I have brittle and weird nail, so keeping them painted is a must. Loving the, good color payoff , easy to dry nail polishes from this range. Colorma nail polishes are a boon when you need a pop of color in your outfit. The red stands out in the crowd. 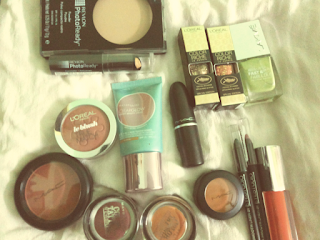 On to some lighter stuff, this month I shopped like crazy for cosmetics. I am put off by the clothes, as I moved one size up to L this month. I dread going inside the trial room, only to be frustrated and sad that size M doesn't fit me anymore. I know, I don't need ton's of beauty products to look pretty and I have relatively well behaved skin...still makeup I have noticed improves my self confidence. 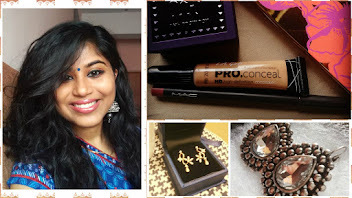 I don't use heavy makeup on a day-to-day basis..my Maybelline BB cream, kajal n lipstick pulls me through the day. So, all this long introduction just to show you how much makeup stuff I hoarded last month. This is the loot for the month of June. I so miss buying cosmetics..Still under a self ban of buying cosmetics..Do u buy new cosmetics every month? ?I would luv to do that but the prices are too ex at times here..